Storm Reports Backfill - Storm report data now goes back to 2005. You can access this data via Reports -> Map and adjust the filters for the desired time period. Please note results have been limited to a three month duration. Home page redesign to emphasize recent stories. Like everything else will tack on new features as we go. News page was removed, wasn't really that useful. Re-categorization and reduction in the number of categories. We have categories, topics, and tags with categories being the highest level of grouping. Topics will be more important down the road. Working on getting the category page going which I think will work similar to the Tags page. Warnings and warning emails - In June (i think) we had to turn off warning alert emails for those with subscribed and had a valid home location. The issue is that we had no way to separate a watch issuance from an update; so each update was treated like it was new. NOW, only new, upgrade, or blank warning action types lead to emails. And the email warning system has been turned back on. Please contact us if you see anything unusual. Like before only warning level alerts should be sent. Special thanks to Jeff Last of the NWS for his help getting that figured out. The feed also reflects these changes. Welcome posts that are automatically generated by the system have been removed from the feed. We will do something else with these. Teleconnections panel, Version 1. 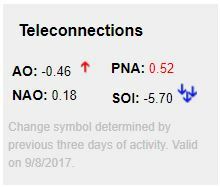 - On the forecast page on the upper right (or down below on mobile) you will see the new teleconnections panel with AO, NAO, PNA, and SOI listed. My advice to you is keep an eye on these daily trends and see watch for trends relating to our weather. There are certain relationships between teleconnections that are stormier than others! Redesigned story items to give the stories created by our page admins more pop. Social links on account page that are displayed on you're profile. Not required, but kind of nice to have. Laid ground work for 3 hr, 1 hr forecast resolutions. Would be cool to bring that back. Simply testing the data feed on this update. 12Hr Min/Max Temperature maps have been added, hoping we've fixed the bugs but this might be a work in progess. These can be found on the forecast page beneath Current Radar and Warnings. Each map is refreshed once per day. Logo redesign, wanted a longer logo to fit the space. Bug fixes on the profile page relating to favorited items. Future plans include finishing a storm chase summary tool. This is priority number 1. Thinking about how to use the historical data we already possess throughout the website. Also planning a new locations system but that might be a ways off yet. If you are having trouble displaying WISCONSINWX.COM, try hitting CTRL & F5. Otherwise clearing you're cache might work too. Thanks for reading!